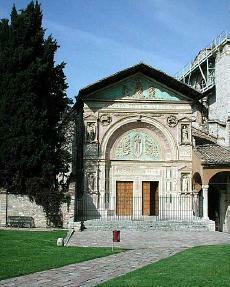 Shortly after the canonisation of San Bernardino of Siena in 1450, who had preached in Perugia on several occasions, Franciscan monks of San Francesco al Prato decided to build an oratory in his honour. [the Oratory of San Bernardino]. The city authorities commissioned Agostino di Duccio to design the facade. This architect had just finished another commission, also a Franciscan church, theTempio Malatesta in Rimini. The polychrome front was finished in 1461 and makes use of a combination of different materials ranging from terra-cotta to limestone, as well as white, red and black marble. It is structured around an arch that stands between pilaster strips and functions as the support for a sculptural ensemble in flat and half-round bas-relief that is considered to be the most important Renaissance monument in Perugia and depicts the miracles performed by San Bernardino. The twin portal leads to a Gothic interior with an altar formed by a 4th century paleo-christian sarcophagus of the 4th century. It contains the remains of Beato Egidio, one of St Francis' friars, and was brought here from the nearby church of San Francesco al Prato. Behind the altar two doors lead to the Oratory of St Andrew. The lacunar wooden ceiling is from 1558, while the stucco work and paintings were carried out in the 18th and 19th centuries.